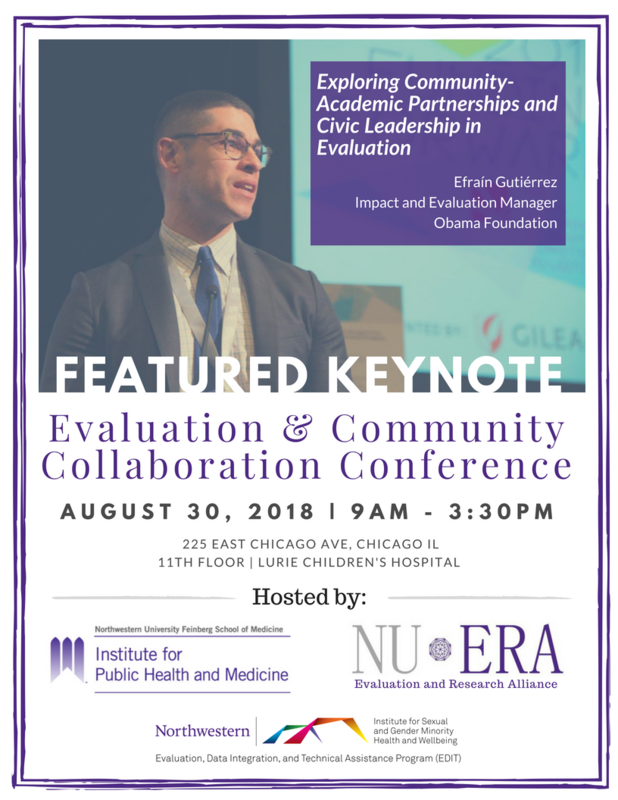 Chicago evaluators are invited to attend a conference on Evaluation & Community Collaboration hosted by the Institute for Public Health and Medicine at Northwestern University Feinberg School of Medicine; the Evaluation, Data Integration, and Technical Assistance Program at the Institute for Sexual and Gender Minority Health and Wellbeing at Northwestern University; and Northwestern University's Evaluation and Research Alliance. This conference will include representatives from Northwestern University, community agencies, and the Chicago Department of Public Health to talk about their experiences working together on comprehensive HIV prevention demonstration projects since 2015, and will start an honest discussion about how funders, community, and academic agencies can better work together to improve our response to HIV and other problems facing our community. The conference is open to all! Please RSVP using this link (http://bit.ly/EC2Conference) and please forward this link & Save the Date below to anyone – providers, researchers, and community members – who would be interested. Thanks in advance! Feel free to reach out to EDIT@northwestern.edu with any questions.